I’m sure you’ve noticed by now my love of all things Buffalo sauce! I just can’t get enough! This month when my Food Network magazine came it had a cute little pamphlet of 50 Grilled Cheeses. They had some fun ideas. 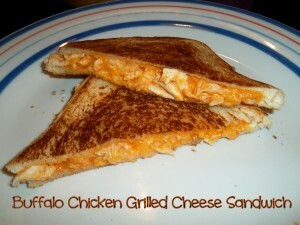 Derek and I decided to make up our own grilled cheese and came up with this Buffalo Chicken Grilled Cheese Sandwich. We loved it! It was so fast to make and was so good we’ve had it twice since. What are you favorite grilled cheese sandwiches? In a bowl, mix together the chicken, mayo and Buffalo sauce. Cover a piece of bread with cheese, then chicken mixture then more cheese then press a piece of bread on top. Repeat with remaining bread. Place a nonstick skillet on the stove over medium-low heat. Butter the top of the sandwich and place butter side down in pan. Press sandwich and cook until golden brown on bottom. Butter the top of the sandwich and flip. Cook until golden brown. Repeat with the other 2 sandwiches. You have a nice blog. An award awaits you at my blog http://www.krishnankavita.blogspot.com. Please head straight to my blog home page to collect your award!